The Elwins play a free lunchtime show at Sugar Beach today. Artwork by Matt Vergotis and AndreasJD. 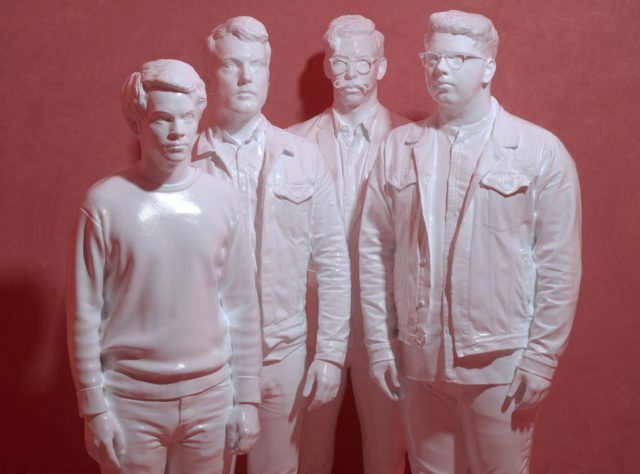 Exuberant pop act The Elwins, whose new album Beauty Community drops in mid-October, are playing the 102.1 the Edge’s Sugar Beach Session series midday today, before they embark on their fall tour. The studio, which faces out onto the white sand and pink umbrellas, will open their bay doors wide and present the band live, playing a selection of their new tunes. Sugar Beach (11 Dockside Drive), 12:30 p.m., FREE. Two of Toronto’s cleverest comics return for “Season Three” of Salomon and Smith, tonight at Comedy Bar. Comedic partners Jess Salomon and DeAnne Smith (who’re both in lesbian relationships, but platonic pals—they even have a podcast about it) welcome stand-up guests Dawn Whitwell, Andrew Barr, and Sara Hennessey, who recently had two shows added due to demand to the just closed JFL42 comedy festival. Comedy Bar (945 Bloor Street West), 9 p.m., $10. Tonight’s previously scheduled comedy show Last Night On Earth, and all subsequent Comedy At the Broadview shows, have been cancelled. Click here to view Tuesday’s picks.